Over a year ago when we were planning for the walk we had the idea to make the blog a photo story telling project all about gratitude and have that be the theme of the walk. We decided it would work better to keep the blog more broad, but we still wanted to do posts where we interviewed people we met on the street or stayed with and asked them what they were grateful for; below are their answers. Another post from our night spent Couchsurfing in Lancaster, PA with Sheldon and Naomi, and from our conversation with fellow Americorps alum Amy Stewart and Kerry Aszklar! Below is a transcript of our conversation with Amy about the importance of affordable housing in a smaller community, like Lancaster. Tell us about the affordable housing project you are currently working on…who runs it, why it started, what some of the goals are etc. Currently I am working with the Chestnut Housing Corporation (CHC), a small nonprofit affiliated with East Chestnut St. Mennonite Church in Lancaster, PA. Two of the stated purposes of the congregation are “to equip one another to live peaceably and generously” and “to contribute to the well-being of Lancaster City and the wider world”, and so CHC was begun in 2010 by several members of the congregation who wanted to respond to the call for affordable housing in the city. CHC’s goal from the beginning was to renovate and rent 10 affordable apartments through donations, volunteer labor, and partnership with Tabor Community Services, a Lancaster nonprofit that teaches residents how to solve housing and financial challenges. The most recent project is renovating an old bar with four units above it at 547/549 E. Chestnut St. This property will bring CHC to meet its goal of 10 affordable apartments. What are some of the biggest challenges facing the Lancaster community right now? One of the ongoing challenges is that Lancaster County has one of the highest occupancy rates in the country. This makes housing difficult to find, and drives up the price of rent. This is a very complex problem, with ties to questions of zoning laws, construction and development costs, population growth, land use (Lancaster County is renowned for its farmland), government assistance programs, community responsibility, etc. What CHC is doing is important, but is a drop in the bucket compared to what some have termed a “crisis”. What is something about affordable housing you wish more people knew? I simply wish more people knew that affordable housing is a growing issue. That’s the first step in addressing it. For those of us not struggling, it’s really easy to assume everyone else is similarly situated, but that is not the case. According to the Lancaster Housing Opportunity Partnership (LHOP), “72% of Lancaster County households spend 45% of their income on rent and transportation, making it difficult to afford food, medical care and other living essentials”. And it’s not only Lancaster that lacks affordable housing; look, and you’ll find shortages everywhere. Secondarily, I’d mention that there are lots of nonprofits, governments, and coalitions out there partnering up to confront housing challenges. To name a few locally, we have LHOP, the Lancaster County Coalition to End Homelessness, Tabor Community Services, and the city and county governments. Nationally, there are organizations like United Way and Habitat for Humanity, and there is the National Alliance to End Homelessness with its “Housing First” plan. Effectively responding to the need is going to take a lot of work and a lot of leadership. How do you think affordable housing can build community? To take it back a step, the primary question historically has been: do we believe we are a community? If so, what does that look like and are we willing to work for it? I believe that providing affordable housing doesn’t just build community, but is more fundamentally part of what it means to be a community. Affordable housing works to ensure security, stability, and equity. Through fostering health and well-being, making opportunities more accessible, and nurturing self-reliance and education, affordable housing helps provide a piece of a solid foundation from which individuals can reach their full potential and in turn give back to their community. This article is most recent. Evicted by Matthew Desmond is a worthwhile book about housing security. 2015 article on housing in Lancaster County. 2012 article on housing in Lancaster County. A publication of LHOP. See page 3 for mention of the Chestnut Housing Corporation. See page 4 for 72% statistic. My dream is to create a structured direct service organization for adults that would be long-term, full-time, team-based, and residential. I envision working primarily through existing nonprofits focusing on concrete issues such as food access, affordable housing, sustainability, education, and community-building. To this end, I am developing my network and pursuing further education in the realm of public service. I would welcome thoughts and feedback on this lofty aim! Anything else you’d like to add about Lancaster, yourself, affordable housing, etc. we didn’t ask but you want us to know! I’d like to add that I graduated from St. John’s College in Annapolis, as it has a dear place in my heart. It is a small liberal arts college where we study a prescribed program of classics through reading and discussion. There is also ample opportunity to be involved in extracurricular activities. I would not be who I am or where I am today without the intellectual freedom, invigorating discussions, well-rounded exploration of what it means to be human, and the extracurricular leadership opportunities I experienced at St. John’s. I most recently spent two years serving in the AmeriCorps National Civilian Community Corps (NCCC, pronounced “N-triple-C”). Based on the Civilian Conservation Corps of the 1930s and the U.S. military, the mission of NCCC is to strengthen communities and develop leaders through direct, team-based national and community service. Designed for those ages 18-24, members are assigned to one of five campuses across the nation, each responsible for a multi-state area, and then complete a series of months-long projects in partnership with various nonprofits or government organizations. It was a humbling experience to serve in five states in our nation, and I would not trade this experience for anything. When our Couchsurfing hosts, Sheldon and Naomi, heard we were Americorps volunteers, they invited their family friends over who were also Americorps alum, and had similar passions for affordable housing and social justice. We spent the evening talking about our experiences volunteering, and learning about various issues pertaining to housing in Lancaster, PA and elsewhere. Below is an interview with Kerry Aszklar, who we met that night, and will be embarking on a Bike & Build journey soon . What made you want to do bike and build and what do you see as the connection between transportation and housing? Bike and Build has been on my adventure list since I started bicycling in college and interning at a bike advocacy nonprofit in Boston. I love bikes as a method of transportation, since they can be very accessible to many people, save money, and don’t rely on gas! The connection between transportation and housing is huge – they tend to be the two biggest expenses on a household’s income. Building affordable housing for families and individuals isn’t sustainable unless there is equitable and safe transportation – whether it is public transit, bike infrastructure, or cars – to important places such as jobs, grocery stores, hospitals, and schools. The success of one is tied to the success of the other. What were some of the biggest challenges facing the communities you served in as an Americorp volunteer? It’s difficult to say what some of the biggest challenges facing the communities I served in as an AmeriCorps Member. The issues facing a community in one place differed vastly in another. Regardless, I found genuinely good-hearted people in every place! What is something you wish more people know about affordable housing? 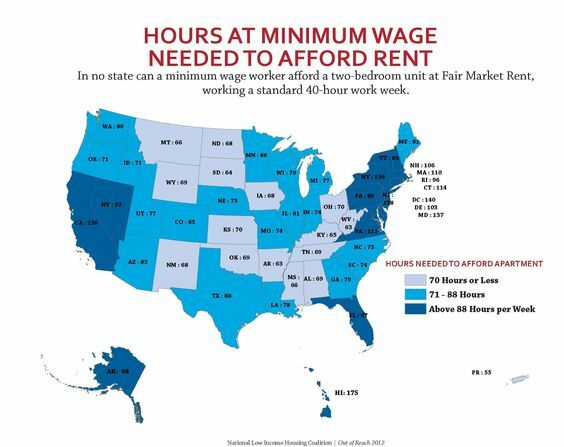 There is no state nor metro area that has an adequate amount of affordable housing! But volunteering or working for an affordable housing organization is a great way to begin to address this problem. Additionally, educating ourselves about the issue is crucial – did you know that a home is considered affordable if rent and utilities do not exceed 30% of a household’s income? What are some solutions you would like to see for the housing crisis? Is there anything else you’d like to share about your Americorp experience, plans for the future, or anything else? Check out Kerry’s blog here and make sure to follow along on her journey! Erich Sekel from Jersey City, New Jersey. “Jersey City is the United States. We are the most ethnically diverse city in the country, which is what makes us so amazing. I’m obviously biased because I’m from here, but in Jersey City, people of all backgrounds, ethnic and religious live together. We are a proud city. It was a pleasure getting to talk with Erich in our short time in Jersey City. He was both a gracious host, and an incredible source of knowledge about the city and the challenges facing it’s residents. Erich works as the Associate Director of Campus Ministry for Community Service at Saint Peter’s University. There have been strong ties between Saint Peter’s and the community of Jersey City for many years, and Erich’s relationship to the area has only further cemented it. Erich grew up in Jersey City, and quickly embraced his role’s requirement of working directly with the community, teaching students about the various issues facing the residents that they share their city with. Last year, St. Peter’s students spent over 50,000 hours volunteering and working in the community. As Erich told us, “We are not a closed institution of higher learning, we are in the community striving to better the lives of the residents of Jersey City.” A special thank you to Erich for his kindness and hospitality along our journey. While walking through Princeton, NJ today, we were stopped by a family along the road. They had been sitting and eating pizza when they saw us walk by the restaurant window, and wanted to ask us about our journey. Just before they saw us, the mother was offering words of encouragement to the two boys, explaining to them that they were capable of accomplishing anything when they were older. After seeing us, and the sign on the front of our cart, the boys began asking her questions about our journey, and if they could some day walk across the country too. They finished eating their pizza, drove down the road to find us, and gave us some money so we could get our own pizza too! After posing for this picture with the boys, and saying goodbye, we both left that moment in high-spirits. We knew our friends and family were following along on our journey, but it was affirming to see the ways our walk connected us with complete strangers. We arrived at our Couchsurfing location in Princeton tonight incredibly grateful for the kindness and generosity of the countless strangers we have met these past few days. But especially for these two, who gave us a lift when we needed one.